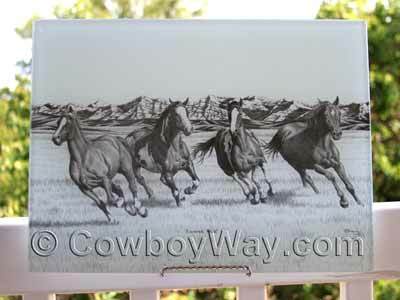 Below are horse designs on cutting boards for sale. Cutting boards with horse designs add a beautiful accent to any kitchen. Many of the cutting boards are also heat resistant and/or suitable for chilling then using as a surface to roll out pie dough. Check each board for individual recommended uses and care. Below: A cutting board with running horses. As you probably noticed, a lot of the horse cutting boards for sale above are made from tempered glass. Just what is tempered glass? Tempered glass is a type of toughened glass, or safety glass. It is four to five times stronger than "regular," or un-tempered glass, and when it breaks it does not break into the super-sharp, jagged edges associated with un-tempered glass. Tempered glass is also heat resistant. Common items made from tempered glass include car and truck windows (excluding the windshield), oven windows, skylights, house windows, refrigerator shelves, and the glass enclosures around bathtubs and showers. If you find a horse cutting board for sale that you like but you're not ready to purchase it right away, you can always add it to your shopping cart so it will be easy to find later. In most cases, Amazon.com will keep track of your cutting board, and anything else in your shopping cart, for 90 days.